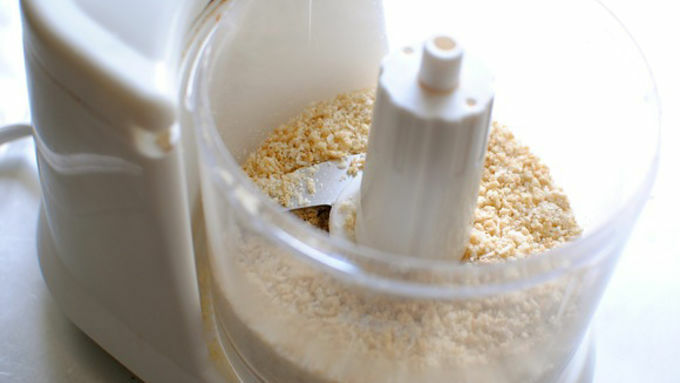 In a small food processor, pulse the Rice Chex™ cereal and the parmesan cheese together, until you get a bread crumb consistency. Set aside. 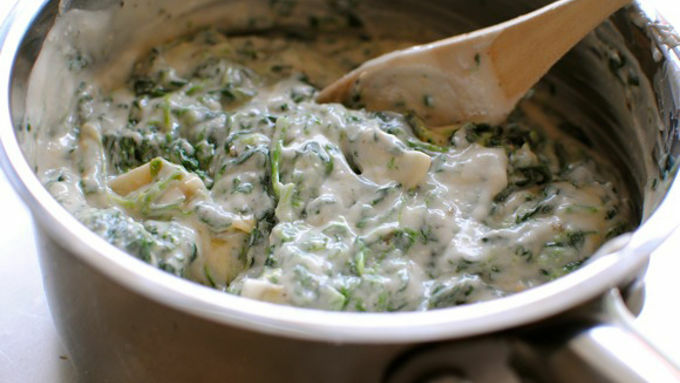 Pour the alfredo sauce into a small sauce pan. 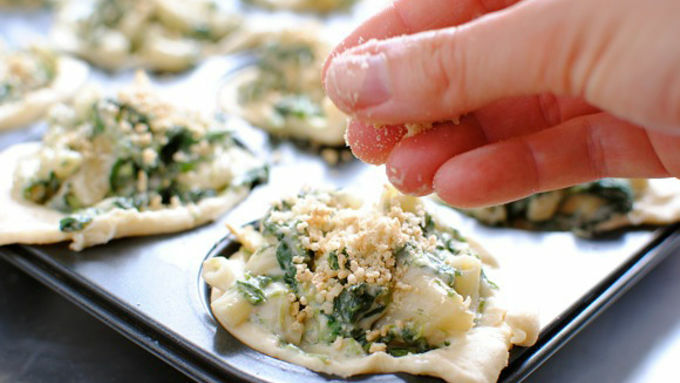 Add the thawed spinach and artichoke hearts. Stir to combine. Bring to a light simmer. Bring a small pot of salted water to a boil. Cook the macaroni until al dente (package instructions). Drain and add to sauce. Stir to combine. 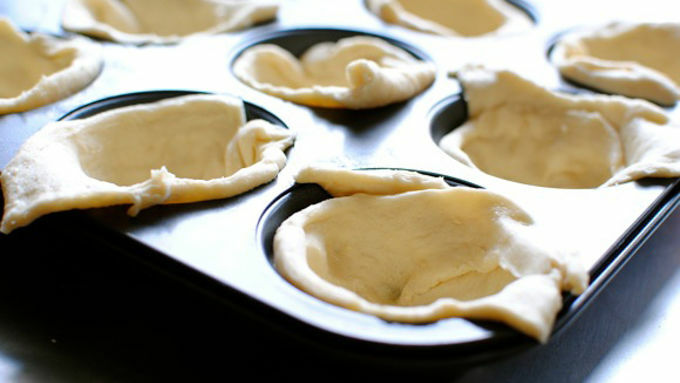 Arrange the crescent rolls in a muffin pan. Be sure and press the dough in the bottom of the tin to cover all of the space. 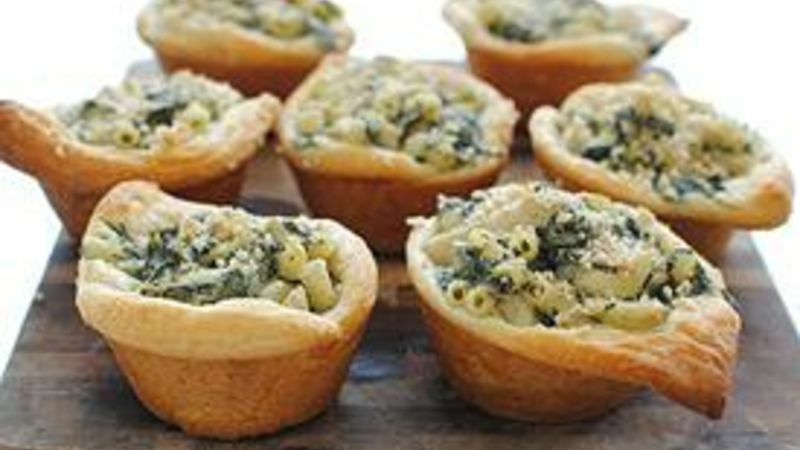 Spoon the macaroni filling into each muffin cup. Sprinkle with the Rice Chex™/parmesan topping. Slide into a 400°F oven for about 15 minutes. Check at the 13-minute mark. Serve immediately. 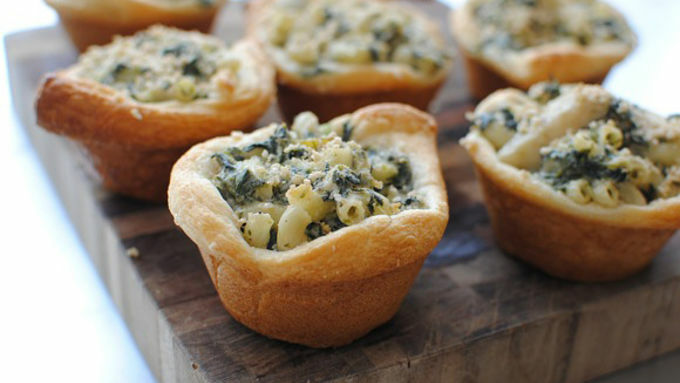 Spinach-Artichoke Mac 'n Cheese Cups: I'm not kidding when I say lids will flip right off. You like eating, right? I mean, I know it's sort of the key to living and all. But you like the act of it, am I right? Good. You like happiness too, right? I mean, I know it's sort of key to our well being and all. But you like to feel happy, am I right? Good. You like to shake, rattle and roll, right? I mean, I know it's sort of key to, well, . . . I guess not much, but let's just go with it. Let me just get to the point. What I have for you today will amaze you. 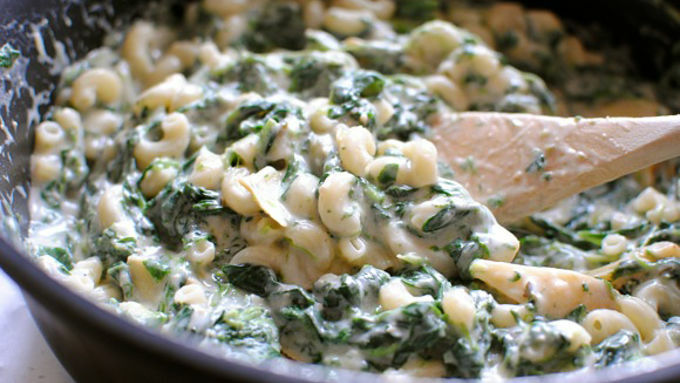 Spinach + Artichoke Hearts + Macaroni + Alfredo Sauce + Pillsbury Crescent Rolls = Heaven. Grab some elbow macaroni, some Green Giant frozen spinach, artichoke hearts, jarred alfredo sauce (I used roasted garlic and died), some Rice Chex cereal, some parmesan cheese and some Pillsbury crescent rolls. The taste of these will straight up body slam you to the ground.